Just ordered a sample... damn you're good!! Must, must, MUST try the Montale. I too adored the CSP and didn't realize they'd reformulated... I thought it was me. Goodness. What a shame. I can't wear the Vanille Banane either. I absolutely love the Amour de Cacao though -- it's the one comfort scent I keep returning to no matter how far I roam. Ducks/Linda, thank you, I hope the Montale will satisfy the original CSP "fix" for you the way it did for me. Lovely writing, as usual. 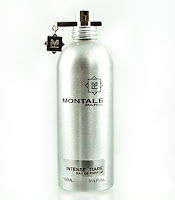 I have a decant of the Montale Intense Tiare, and I'll have to pull it out and try it again. I remember thinking it pretty, but the coconut in it made me feel like I was wearing tanning oil instead of perfume. I tucked it away and decided to save it for the beach, but your review is inspiring me to try it again now instead of waiting for summer. Suzanne, thank you. I found the coconut to be subtle enough to keep it from being TOO beachy - but maybe my idea of "subtle coconut" is someone else's "way too much." I love it any way I can get it. Great review...I personally can't wear white florals but Intense Tiare is too magical to ignore. Feels very luxurious to wear and one spritz last a full two days(shower included)! !